A former police training academy in Feeding Hills will be the future site of 51-units of housing for veterans. The project just got a big lift with the announcement that Springfield Citizens Bank is providing 10-million dollars in construction financing. Veterans like Pepito Caballero, the general manager of Soldier On says the need is great,” There’s a lot of homeless veterans out there looking for help,” said Caballero. He credits Soldier On with helping him turn his life around, ” They helped me a lot, they gave me the opportunity to stay out of trouble, not being homeless,” said Caballero. More veterans will have the same opportunity as Caballero thanks to the conversion of the former police training academy in Feeding Hills into housing for veterans. Gary Shepard is the president and chief operating officer of Soldier On, “Veterans are two to three times more likely to be homeless than any other segment of our population so providing homes for veterans who are homeless are critical to their advancement and development in re-adapting them to the community,” said Shepard. The key to the Soldier On Project is not only to get veterans a place to live but provide them with services they need as well to move forward with their lives. Besides the 10-million dollars in construction financing from Springfield Citizens Bank, other sources of funding have come from historic tax credits, low income housing credits, and state funding. Total price tag nearly 24-million dollars. And veterans will enjoy pride of ownership,” It is limited equity type of housing where the veterans actually own their units, and the nice thing about this they will be paying taxes to the community of Agawam on these units, so they take pride in home ownership,” said Gary Shepard. The units should be ready for occupancy in about a year and a half. Comments Off on Soldier On Furniture Fundraiser! In June, 44 formerly homeless veterans will be moving into Soldier On’s new Gordon H. Mansfield (GHM) Veterans Community in Leeds, MA. This limited-equity cooperative is modeled after Soldier On’s successful Pittsfield GHM Veterans Community and features beautiful, sustainable, LEED Gold certified design and serves as permanent housing that is owned and operated by the veterans living within it. Soldier On provides direct services to each resident of the cooperative such as case management, counseling, addictions support, transportation and employment training and assistance. Today, the veterans of Soldier On need your help! We are asking that friends of our organization donate or fundraise so that we can purchase furniture for each of the 44 new homeowners. Each room will cost $2,500 and will include bedroom, kitchen and living room furniture – everything necessary for veterans to feel comfortable and established in a new home. We would like to give supporters the opportunity to memorialize a loved one in this initiative! Funders who donate or are able to raise $2,500 through Crowdrise will be given the opportunity to name a unit of this new cooperative in memory of a friend or loved one. The name will be proudly displayed on the door of the unit they fund! 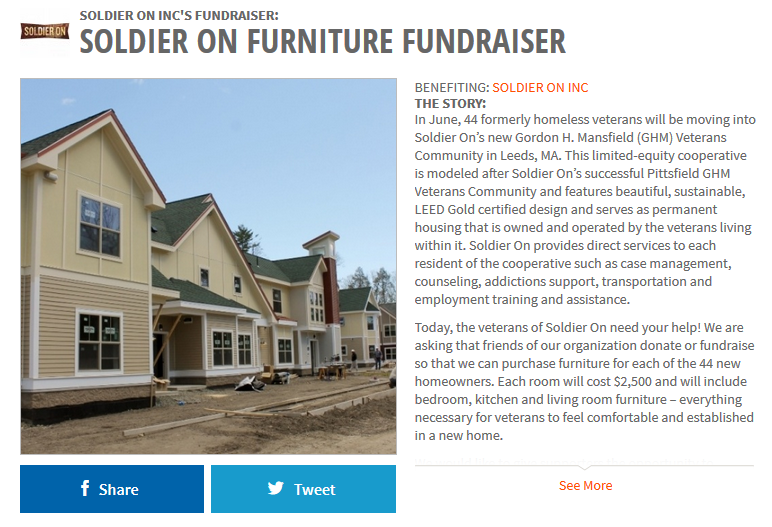 If you would like to join the Soldier On fundraising team, visit the Soldier On Furniture Fundraiser page and click “Fundraise for This Campaign” on the right side of the page to begin fundraising. To make a donation, simply click “donate to this fundraiser”. We thank you for your support of Soldier On and willingness to contribute to this community of new homeowners!